…and we love you, too, John Burt. Trolling the internet, at times, can unearth some interesting tidbits. Such was the case when I recently came across a facebook posting promoting an upcoming appearance of Republican presidential candidate, Carly Fiorina, at the New Boston Central School. 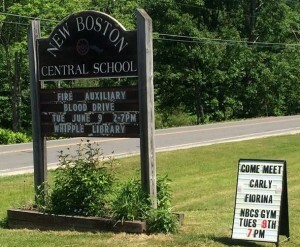 A seemingly innocuous post that one would think wouldn’t elicit an attack on a neighboring town, but elicit an attack it did and not from an everyday person just spouting off. No, but from an elected State official in the body of State Rep. John Burt (R) who lives in Goffstown and represents Hillsborough County District 39 that include towns, Goffstown, Weare and Deering, NH. Really? 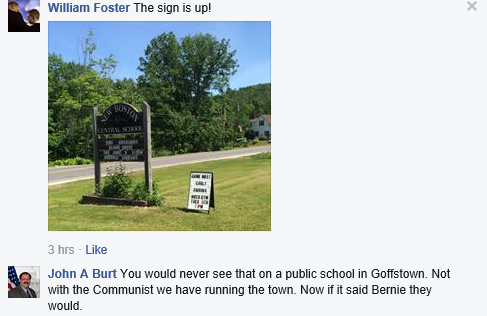 There are communist running the town of Goffstown? Oh my, call out the militia, where’s the NSA when you need it to apprehend these horrible reprobates that have, obviously, taken over our quaint little town? I thought if this is true, than I better look into this. So I went on the town website committee page to find out who these scary communist could be. 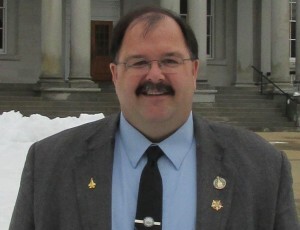 I found there are approximately 191 individual Committee/board members, 59 of which are elected directly from the voters. But, try as I might, I couldn’t find any communist. What I did find was a diverse group of volunteers. People from all walks of life; veterans, seniors, young folk, men, women, Moms, Dads, just hardworking people giving their time for a better community. So could Rep. John Burt please list which of the above volunteers are communist? And while he’s at it, could he please answer why he hates this town so much that he continues to embarrass and malign us at every opportunity he gets yet cries for our vote when he runs for public office? Oh yes, and you might want to also ask him what legislation he has filed on behalf of the town he suppose to be representing or is he just representing himself?